Book Horde: Labor Sunday New Release, and Free and Sale Books! Labor Sunday New Release, and Free and Sale Books! 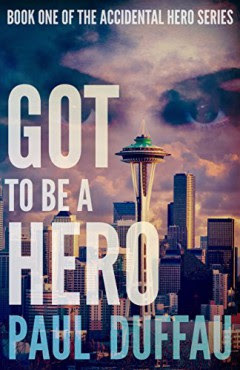 Got to Be A Hero by Paul Duffau is finally available for sale! I raved about this modern YA Fantasy back in June. It's an exciting mystery thriller with great world-building. Read my review or just go and straight to get the book at Amazon. Mitch Merriwether spots two thugs abducting runner and martial artist McKenzie Graham in broad daylight. Acting on instinct, he sprints to save the girl. A split-second decision lands Mitch in an arcane world where conspiracies rage and hidden magic rules. Fast-paced and intense, Got To Be A Hero keeps readers up at night turning pages. 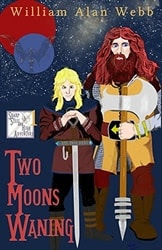 Another new fantasy release, Two Moons Waning by William Alan Webb is on a limited time introductory sale for only 99c! This is book 1 in the new Sharp Steel and High Adventure series. There was a time when heroes carved their own destinies with only a mighty sword and a reckless soul. When bravery trumped bravado and fortune favored the bold. Exotic lands teemed with wondrous beasts and sorcerers laid blasphemous spells. In those far-off days, legendary folk trod the glory road of sharp steel and high adventure. After surviving a fight to the death with the giants of the high peaks, the feared Yetondi, Alden Havenwulf and Dexter Reedman struggle through a blizzard to find shelter in a fortuitous cave, where someone has built a fortuitous fire. They don’t know they’re being watched. A beautiful but feverish young woman mumbles that she was headed for the legendary Valley of Askandria, where the streets are literally paved with gold, but her father and brother went out to hunt and never came back. Smitten with the helpless girl, Alden vows to take her there himself, while Dexter goes along to investigate the rumors of gold for the taking. Soon they’re marching through a tunnel that is said to lead to the lost valley. It seems straightforward enough until the first deadly danger springs out of the darkness, and they realize the further they go, the greater becomes their peril. 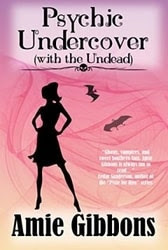 Last but not least, for the next four days Psychic Undercover by Amie Gibbons is completely FREE. This is book one in the The SDF Paranormal Mysteries series. Grab it now! Now, with the vampires' investigator, Quil, on her case, the sparks are flying and the jurisdictional battle isn't the only thing heating up as they race to solve the case before the killer strikes again! All three of these books are also free to read anytime for Kindle Unlimited subscribers. If you want to see if subscribing is right for you, can get a Kindle Unlimited 30-Day Free Trial.